It sounds as if his main argument is that Cook efforts are counter productive because Cook is not an American Republican, which is hard to fix. As an example of how you communicate climate science the right way, Kahan mentions Katryn Hayhoe as an example. Hayhoe is an evangelical climate change researcher and stars in three beautifully made videos where Hayhoe talks about God and climate change. Except that she also talks about her religion, I personally see no difference with any other message for the general public on climate change. She also openly speaks about the disinformation campaign by the climate ostriches. The most frustrating thing about her position, she says, is the amount of disinformation which is targeted at her very own Christian community. Maybe naively, but I was surprised that the Christian community is a special target. While I am not a Christian myself, my mother was a wise environmentally concious woman and a devout Christian. Also when in comes to organized religion, I remember mainly expressions of concern about climate change. Thus I thought that Christians are a positive, maybe even activist, force with respect to climate change. Thus let's have look what the Christian Churches think about climate change. Since Skeptical Science published the Pac Man of The Consensus Project, the benign word consensus has stirred a surprising amount of controversy. 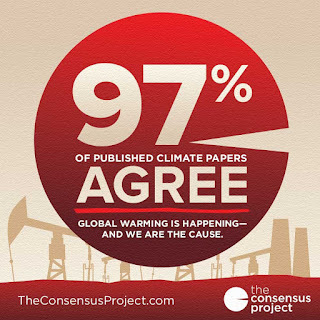 I had already started drafting this post before, as I had noticed that consensus is an abomination to the true climate ostrich. Consensus in this case means that almost all scientists agree that the global temperature is increasing and that human action is the main cause. That the climate ostriches do not like this fact, I can imagine, but acting as if consensus in itself is in bad thing in itself sounds weird to me. Who would be against the consensus that all men have to die? I also fully agree with your statement. "This [disagreement] is what drives science forward." The latter is an important agreement, given a recent opposite trend, i.e. towards consensus building, which unfortunately has affected climate science (and not only). So, what is the role of consensus in science? Is it good or bad is it helpful or destructive, should we care at all? In a recent post on the value of peer review for science and the press, I have argued that one should not dramatize the importance of peer review, but that it is a helpful filter to determine which ideas are likely worth studying. A paper which has passed peer review, has some a-priory credibility. In my view, consensus is very similar, consensus lends an idea credibility. It does not say that an idea is true; if formulating carefully a scientist will never state that something is true, not even about the basics of statistical mechanics or evolution, which are nearly truisms and have been confirmed via many different lines of research. I looked a bit further on Alexa and this good news is not limited to these two. All the "sceptics" blogs I knew and had statistics are going down. Bishop Hill, Climate Depot, Global Warming, Judith Curry, Junk Science, Motls, and The Blackboard (Rank exploits) are all going down. Interestingly the curves look very different for every site and unfortunately they show some artificial spikes. Did I miss a well known blog? 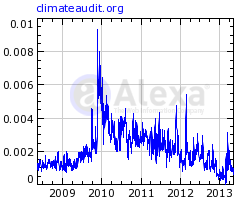 My last post showing that the number of readers of Watts Up With That and Climate Audit are declining according to Alexa (social bookmarking) has provoked some interesting reactions. A little research suggests that the response post by Tom Nelson: Too funny: As global warming and Al Gore fall off the general public's radar, cherry-pickin' warmist David Appell argues that WUWT is "Going Gently Into That Good Night", could be a boomerang and another sign of the decline. More on that and two more indications that climate change ostriches are on their way back. "how do you know it is not a general diminution of interest in climate change?". That is naturally possible and hard to check without access to the statistics of all climate related blogs and news pages. However, as you can see below, the number of readers of SkepticalScience and RealClimate seem to be stable according to Alexa. This suggests that the decline is not general, but specific to the "sceptic" community. It seems as if the age of Climategate is over (soon). 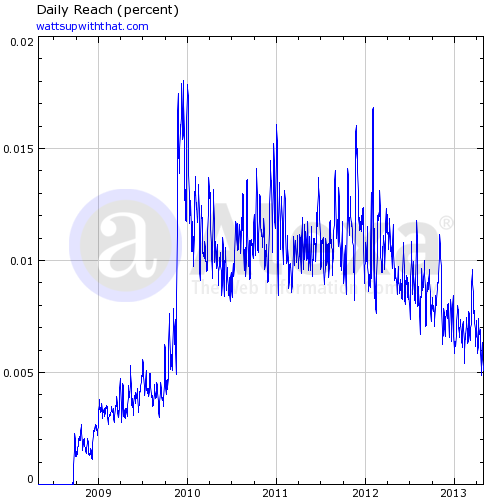 Below you can see the number of Alexa (social bookmarking) users that visited What Up With That? At the end of 2009 you see a jump upwards. That is where Anthony Watts made his claim to fame by violating the privacy of climate scientist Phil Jones of the Climate Research Unit (CRU) and some of his colleagues. Criminals broke into the CRU backup servers and stole and published their email correspondence. What was Phil Jones' crime? The reason why manners and constitutional rights are not important? The reason to damage his professional network? He is a climate scientist! According to Watts and co the emails showed deliberate deception. However, there have been several investigations into Climategate, none of which found evidence of fraud or scientific misconduct. It would thus be appropriate to rename the Climategate to Scepticgate. 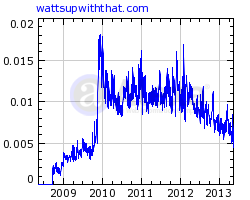 And it is a good sign that this post-normal age is (almost) over and the number of visitors to WUWT is going back to the level before Climategate. Since the beginning of 2012, the number of readers of WUWT is in a steady decline. It is interesting coincidence that I started commenting once in a while since February 2012. Unfortunately for the narcissistic part of my personality: correlation is not causation. The peak in mid 2012 is Anthony Watts first failed attempt in writing a scientific study. According to WUWT Year in review (Wordpress statistics), WUWT was viewed about 31,000,000 times in 2011 and 36,000,000 times in 2012. However, a large part of the visitors of my blog are robots and that problem is worse here as for my little read German language blog. Alexa more likely only counts real visitors.